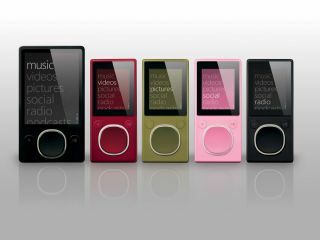 Microsoft has decided to drop the 'Social' music service from its Zune digital music player offering. Zune Social, the online music community which in theory allowed Microsoft Zune owners to share songs between them over Wi-Fi, has been crippled by poor design ever since its launch. In order to share songs, you needed to have all your Zune-owning friends around you at the same time. And since the Microsoft Zune hasn't exactly been a best-seller so far, this approach has proven disastrous. Now, Microsoft has reconsidered. For the launch of its 2nd-gen Zunes on 13 November (US only), Microsoft is pushing how users can personalise the Zune instead. Under the new marketing banner, 'You make it you', Microsoft will quadruple its Zune ad budget, Advertising Age reported. "It's a launch to get the brand going - our first big campaign," said Chris Stephenson, general manager of global marketing at Microsoft Entertainment. "We are very much aware of the strength of our competition, but once our company gets into something, it will not give up," Stephenson said, adding Microsoft likes its challenger status. "It's good being in the No. 2 place - we can fight the good fight. "If you look at how many people have an Apple iPod globally, it's less than one half of a per cent," he said. Much of music and entertainment is driven by software, and "no company is better positioned to deliver on that software than ourselves." We'll have to wait and see if the more personalised approach helps Microsoft shift more units of the Zune. The good news for Microsoft is that its second bash at attacking Apple's iPods certainly looks better. They're thinner, with a neat 'squircle' (square circle) nav-pad. The flash-based Zune, comes in 4GB and 8GB sizes; its bigger brother is an 80GB HDD model.